Chevrolet has done it. The Corvette has gone from being a world class sports car with a "but" to a sports car the world finally has to recognize. Put simply, the 2014 Corvette is one of the best sports cars ever born in America. Every single time a new Corvette is released, Chevy makes a bunch of promises. "This car competes with the Porsche 911 on every level." "The interior is vastly improved." "This is unlike any Corvette that came before." "This is the new sports car benchmark." But the Corvette has never really followed through. The interior, for lack of a better word, has always been crap. On back roads, it's been point-and-shoot. The styling has been largely derivative, too stuck in the idea that heritage, not performance, is what sells Corvettes. Chevy is right. The Corvette name is stocked with cachet, but it's equal parts negative and positive. There's a certain group of people who believe performance starts and stops with a fiberglass wedge from Bowling Green. Then there's another group. The group that will deride the Corvette no matter what performance numbers it puts out or what other cars it beats. For 2014, Chevrolet made a ton of promises again about the Corvette. This time, they've executed on basically all of them. Styling has thrown decades of circular taillights and heritage into the trash, usurped with one of the most polarizing designs on the road today. The trash can interior is gone, replaced by something that's actually decent. There's innovation under the hood and in the drivetrain. What Chevrolet has created is a car that is an incredibly Corvette-y Corvette, but also a car that can compete with the best from around the world. This is the right type of hybrid. If you're a Corvette traditionalist, you're going to be pissed off. I parked the C7 next to a C6, and the change is so drastic that it looks like this is actually a C12. Since the original Stingray, the Corvette has had round or oval rear taillights (bar a rounded rectangular interlude in the C4). And while tradition is tradition, it hasn't evolved. If you think the evolution of the Porsche 911 is slow, then you haven't looked closely at the Corvette. 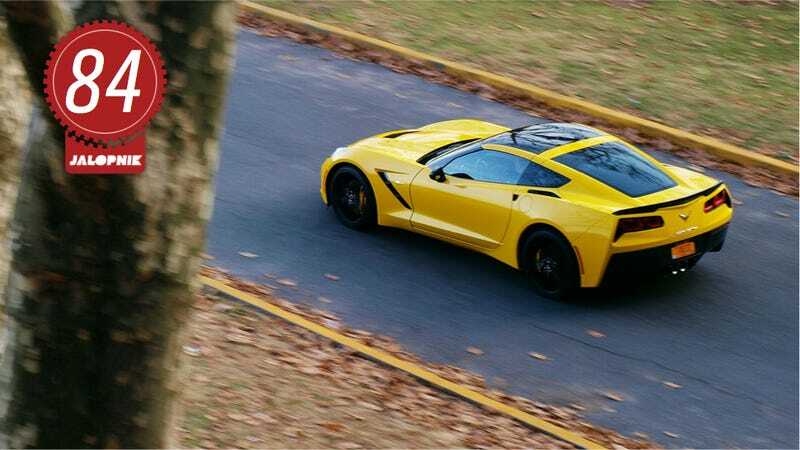 Chevy knows that the exterior appearance of the C7 is divisive and will piss off the Corvette faithful. But they have to reach out beyond that group since the Corvette's current owner base is aging. They need to extend that appeal, and making the car look like a Transformer is one way to do just that. I know not everyone loves it, but I do. I think this is the most dynamic looking car on the road. I am not as keen on all the contrasting black accents. The car I drove was an obnoxious yellow that I'd never ever order. All of the black accents, like the wing, rear bumper, side gills, and more, look cheap. This just looks like an angular bumble bee. The last 'Vette interior looked like vomit. It was a plastic hell with cheap textures and gauges (or gages, in GM parlance) that looks like they'd be at home in an Aveo. The seats were unsupportive barcaloungers and the gearshift looked like GM had a bigass gift card to Pep Boys. The new Corvette's interior is quite similar to another brand new performance car: The Jaguar F-Type. Both have a center touch screen flanked by a handle on the passenger side, a subtle way to say "hey, goober, don't reach over here." The stock seats (my car didn't have the aggressive competition buckets) are better than the past, with actual bolsters on the side, though they could be better. Passengers get their own control near the vents for AC and seat heating, which is a nice touch. But it isn't all perfect. Sitting to each side of the TFT rev counter are gauges that look terribly cheap. I'd like to wheel to be a little smaller and thicker, possibly Alcantara covered. Also, the paddles for the rev match feature feel plasticky. The Corvette has never been about its interior. I don't think the interior of the C7 is as massive a leap forward from the C6 as the exterior, but "crap interior" is no longer a valid reason to leave the 'Vette off your list. Chevy's Z51 package puts the 'Vette on aggressive Michelin Pilot Super Sport rubber. When I had the car, temperatures maxed out in the mid-40s, which means it wouldn't hook up in first. Or second. Or third. The new LT1 engine puts out 460 horsepower and an equal amount of torques. That equals 0 to 60 in 3.8 seconds in ideal conditions. And it's not only quick off the line. Let's say you want to go from 60 to 80 MPH. Without downshifting, you just put your foot down and mountain of torque will get you there in mere seconds. If you want to downshift to accelerate, then you might actually turn time backwards as you get up to speed. It's ridiculous. Best part? This is the slowest Corvette. Think about that for a second. How much faster could a Z06 or ZR1 be? Power delivery is linear, but there is a definite moment when the Variable Valve Timing changes the character of the engine. It's just as happy accelerating at low revs as it is running up to redline. If your eyes ever get stuck to the side of your head, stomp on these brakes and they'll be right back in front. Pedal has excellent feel and is easy to modulate. It doesn't grab immediately when you put your foot down, but it gets the job done. And done well. Chevy has once again worked some magnetic ride magic, equipping the Vette with three modes of aggression: Tour, Sport, and Track. In Tour, it rides with the relaxed aplomb of the Cadillac CTS Vsport. In Sport, it firms up to an assertive level. In Track, the suspension is replaced with metal girders. I left the car in Sport for almost the entirety of my driving time, since I found it was the best compromise between relaxing and breaking my back. Sport gives the best road feel for street driving, letting in the bumps you need to know about and isolating you from the crap that would just get annoying. Is it possible to fault a car for being too good? The Corvette has great steering (once again, I found leaving it in sport was the sweet spot for feel and weight) and is fast everywhere. On my favorite back roads, it didn't even flinch at some truly nuts speeds. Most of the time it didn't even feel like it was working. The Corvette is the anti-BRZ. The limits are so high that it just doesn't flinch at speeds sane people do on back roads. If you somehow reach the limit on the road and you lose it, you will be doing approximately 175 MPH when you crash into the trees and end up on LiveLeak. It's still a hoot, still wildly fast, but the speeds you need to do to make the car feel like it's breaking a sweat are the speeds where you'll end up in jail without a license and without a Corvette. On track, the Vette really comes alive, with a quick turn-in and a fun tendency to kick out the tail out on power down. This is fun defined, and where it feels at home. So if you can't reach the limits on the road but can on a track, why buy the Corvette? Why not get a track day weapon like a Caterham or a backroad monster like a turbocharged Miata? For certain people (myself included), that is the answer. I adore this Corvette, but I'd trade some of that speed to know that my car is really working. But if you can only afford one car to do your backroad fun, your track days, and your autocrossing, it would be hard to find a better all around weapon than a new Stingray. The days of the three-speed are long gone, as the new car has seven gears to choose from. Throws are medium length, but direct. The clutch engages high in the travel, but is light and non-binary. Once you get used to having seven ratios to choose from, it's a joy to use. But — and there's always a but with a Corvette — when you aren't used to the extra gear, shifting can get sloppy. Porsche's seven speed in the 911 is a little sloppy, with a slightly rubbery feel. The smart thing they did was lock out seventh gear unless you're in fifth or sixth, that way you don't mistakenly grab it. Chevrolet didn't do that, so for your first few hours in the car, expect a lot of fourth-to-seventh upshifts, some cursing, and then a downshift to fifth, or maybe third, by accident. I'd also make a few ratios shorter, since by the time you hit the top of third you're going around 130 MPH. And you still have four gears to go. The Corvette has always been old school in delivery and execution. Leaf springs and a push rod V8 do not a technological powerhouse make. This one is different. There's the normal fare we now expect, like a backup camera, navigation, and satellite radio. There's also a very informative heads up display, cylinder deactivation, a rev match feature for the gearbox so wannabe heel-toers can roll with the big boys, and a cool reconfigurable display for the tach. What is so cool about a reconfigurable tach, you ask? This one has three different ways to display your revs, and one of them is the same as the digital dash from a C4 Corvette. This is nostalgia of the best kind. The radio isn't very good. The Stingray, like C6 Corvettes, has active engine sound management. Go into the setting, and turn that off. That makes the C7 loud. Always. Always loud. At idle, you have a deep burble. Running up through the gears makes a tenor scream, which sounds exactly what you think it sounds like. In a tunnel, it isn't that impressive with the windows down. But from the inside, it sounds the business. For $53,800, which is the Corvette's starting price, this is an unbelievable bargain. The car I tested, a loaded 3LT with the Z51 package, came in at $72,000. What car can you buy that has this much performance for this few dollars? None, and that's because this has been the Corvette's domain for ages. Fully loaded, this Corvette costs $12,000 less than the starting price of Porsche's cheapest 911. The Porsche still has a nicer interior than the Corvette, but that gap has closed considerably. Like the Nissan GT-R, what Chevrolet has done is build a car that costs far less than its competition, but can ruin them on the road. In fact, the Corvette is very GT-R-ey in how it drives along and makes you feel like a driving Superman. The difference is, the Corvette is more involving with a manual transmission in the middle and rear wheel drive out back. Oh, and it's $40,000 less than a GT-R, which means the Corvette is still a bargain. A bargain that no longer needs an apology. This is America: The Car.